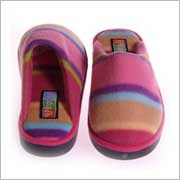 Brightfeet Lighted Slippers; what a great idea! "10 out of 10 toes recommend"
As most of you know I have a very very full house. We have people all over the place. Well my cousin Randy sleeps on the pull out couch in the living room. The room I am usually in (The Den) is to the right of the living room, while my bedroom and bathroom are to the left. As some of you may have noticed I am a night owl. I get up several times and I seem to always wake Randy up. I know this will sound kind of lame, but I am afraid of the dark, so when I walk to the other side of the house I need to turn a light on, and of course that seems to always wake up Randy. And then I have to listen to him whine lol :). Thanks to my Brightfeet Lighted Slippers I don't have to worry about waking him anymore, because these slippers actually have little lights in them. It's really cool because when it's light out the slippers will stay turned off, but the second it turns dark the little lights will automatically turn back on. I think it is so neat! I am proud to say that I did not wake up Randy one time tonight! While you would think the light wouldn't light up to much; well it does, the lights are very powerful and really make is easy to see! I think the Brightfeet products are so neat and innovative! 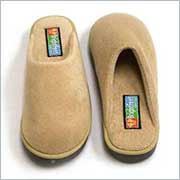 Another good plus is that the slippers are very comfortable. They are so soft and I can just wear them for hours and hours! 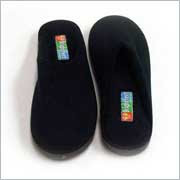 Bright feet slippers are made with 100% Polyester Fleece and come in 5 colors, including.. Navy, Beige, Black, Striped and Camo. All of the slippers come with batteries. And all slippers are available for $29.96. For my review I received the black slippers. I really like the black ones because it's harder to get them dirty. But besides the black I would have to say my next favorite is the Striped, because they are cute and would match with a lot of my pajamas. And if I didn't have to worry about getting them dirty I would probably get the beige, because for the most part I am a rather simple person and I like to keep things neutral. Aren't they innovative? Stop by and see more details for yourself! The great people from the Brightfeet Website are letting me give one on you a pair of Brightfeet slippers in your size, and with your choice of color. Mandatory entry: Visit the Brightfeet Website and tell me which color/pattern you think you would choose. I would pick the striped! I like Brite Feet on Facebook! I'd have to go with a men's large in beige. I like the camo OR the black in a size large (cause slippers tend to run small) Boy, these are nifty-I am forever running outside in the dark (I feed feral cats and when they fight or a dog is around I go out) these would be awesome! I entered the Season's Puffs giveaway. I entered the Seraphina Rose giveaway. I'd choose the Striped pattern. Thanks. I would choose the beige in a women's M.
Have your button on my left sidebar. Entered the Joey Junior Purse Hanger giveaway. Entered the Yanni Creations giveaway. Entered the Seventh Generation giveaway. Entered the Seraphina Rose GC giveaway. I would choose Brightfeet - Navy (L). I entered Digital Photo Frame. I entered $100 Gift Card of Choice. I entered Opaleen Jewelry giveaway. I entered UGLee Pens giveaway. I would pick the black in large for my husband. I have child's feet, size 3, so I can't have one for myself :( If I could though, I'd get pink striped for me.